TripSavvy is aware of the anti-LGBTQ laws recently implemented in Brunei, and does not support this violation of human rights. The name may be a mouthful, but Brunei's capital Bandar Seri Begawan is a different kind of place to visit while in Borneo. Sometimes referred to simply as "BSB", the city is by no means just an extension of Malaysia under a different name. Many travelers come to wealthy Bandar Seri Begawan city expecting an experience similar to Singapore, however they soon learn that this is not the case. Although luxury cars do frequent the relatively clean and wide streets, they are just as often found parked in front of a street stall selling cheap fried rice and noodles. Brunei's official name – Brunei Darussalam – means "abode of peace". The name fits well with the country's low crime rates, an average life expectancy of 75 years, and high standard of living compared to their neighbors in other parts of Southeast Asia. Despite having untouched national parks and great diving in the coastal waters, Brunei makes it onto very few tourists' itineraries for Southeast Asia. The tiny, oil-rich country only gained its independence from Great Britain in 1984. Malaysia extended an invitation to Brunei in exchange for a cut of the vast oil reserves, however Brunei chose to remain sovereign, making it the smallest country in Southeast Asia. The people in Brunei and the capital city of Bandar Seri Begawan remain fiercely patriotic and loyal to their sultan. The same royal family has ruled over Brunei for six centuries! Brunei is the most-observant Islamic nation in Southeast Asia. Visitors are welcomed in mosques outside of prayer times, but proper dress is required. More information here at our mosque dos and don't's article. Smoking is prohibited across Brunei both indoors and on public transport. The sale of alcohol is prohibited in Brunei; locals take the bus to neighboring Miri to imbibe. For more about tippling in the region, read our guide to getting drunk in Southeast Asia. While food remains relatively cheap, accommodation is disproportionately more expensive than in neighboring Malaysia. Arabic is found on most signs and is taught in schools. The people of Brunei speak their own variation of Bahasa Malay as well as English. Read about how we say hello in Southeast Asia. See the King's things at the Royal Regalia Building: This incredible museum should be your first stop in BSB to learn more about the country you are visiting. The building houses a large collection of gifts given to the sultans over the years from various world leaders. Hours: 9 a.m. to 5 p.m. seven days a week; admission free. Visit locals living at Kampung Ayer: It may look like a maze of ramshackle structures standing wobbly on the Brunei River, but Kampung Ayer is home to nearly 30,000 people. Dating back over 1000 years, Kampung Ayer is the largest river village in the world. There is a Cultural and Tourism Gallery with viewing tower open seven days a week from 9 a.m. to 5 p.m. It is possible to walk to the village just west of the Yayasan Shopping Complex or hire a water taxi. Marvel at Jame'Asr Hassanil Bolkiah Mosque's architecture: The largest mosque in Brunei was constructed in 1992. If you go inside of only one mosque during your travels, this should be the one; spectacular is an understatement. The mosque is about two miles northwest of the city center; take bus #22 from the central bus station on Jalan Cator. Read about mosque etiquette before your visit. Have a late night snack at Gadong Night Market: this pasar malam (night market) transforms from a daytime fishmarket into a street food extravaganza after dark. Four rows of tents hold vendors selling a massive menu of authentic Malay dishes: grilled rice rolls known as pulut panggang; doughnut sticks called cakoi; nasi lemak; and all the satay you can eat. Home of the sultans, Istana Nurul Iman is the largest residential palace in the world. Although the palace is approximately three times larger than Buckingham Palace, the awesome structure is tucked away behind a fence and trees making photos impossible. If you insist upon getting close, it is possible to get there by walking to the intersection of Jalan Sultan and Jalan Tutong, then taking a purple bus west. Note: The palace is only opened to the public for a few days each year at the end of Ramadan. Brunei has its own currency - Brunei dollars - which is divided into sen. Although coins exist, prices are often rounded to limit their necessity. Most banks - open weekdays until 4 p.m. - will exchange money and have ATMs that work on all the major networks. Visa and Mastercard are accepted in major hotels, restaurants, and shopping centers. Thanks to an agreement with Singapore, the Singapore dollar is easily exchanged at a 1:1 basis in Brunei. Bus: Purple city buses run six routes servicing Bandar Seri Begawan; you must hail them to stop from the roadside bus stands. Bus fares are typically US 75 cents. Water Taxi: Bandar Seri Begawan is sometimes referred to as the "Venice of the East" because of the many water taxis servicing a matrix of waterways along the Brunei River. 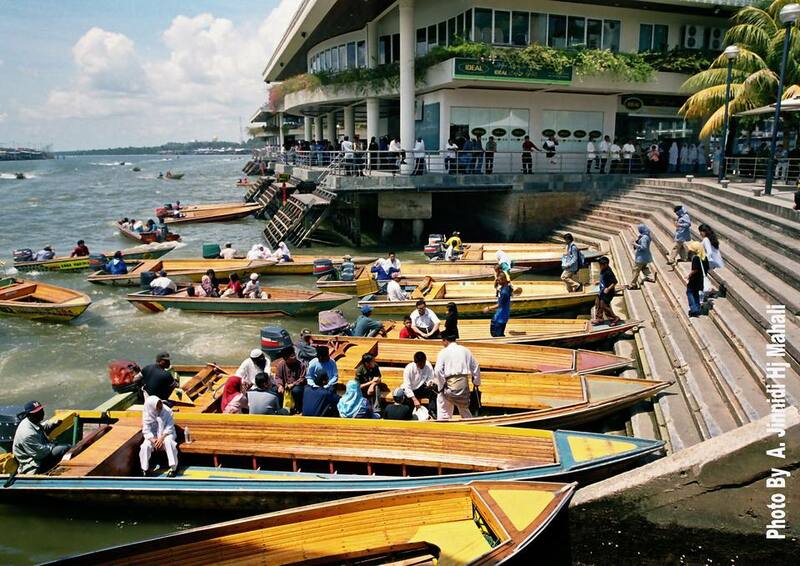 The most common use of the water taxis is to explore Kampung Ayer - the water village. The negotiable fares start around US 75 cents. Taxi: Only a few metered taxis exist; the low fares are a reflection of the cheap petrol prices in BSB. From Sarawak: A single company – PHLS Express Bus – runs two buses a day from the Pujut Corner long-distance bus terminal in Miri to Bandar Seri Begawan. There is no ticket window or representative at Pujut Corner – you must pay on the bus; the one-way fare is about US $13. Depending on traffic and the queues at immigration, the journey by bus takes around four hours. By Air: The Brunei International Airport (BWN) is conveniently located only 2.5 miles away from the center of Bandar Seri Begawan. Five airlines - including Royal Brunei Airlines - operate flights servicing Asia, Europe, Australia, and the Middle East. Departure tax at the airport for destinations in Borneo is US $3.75; all other destinations US $9. Read more Brunei travel information. Although buses directly from Miri in Sarawak to Kota Kinabalu in Sabah do exist, they weave in and out of Brunei many times. The route can add as many as 10 stamps to your passport and consume hours of waiting at immigration. One great way to avoid all the border bureaucracy is to take the ferry from Kota Kinabalu to Labuan Island (3.5 hours). From Pulau Labuan, it is possible to take a two-hour ferry to Bandar Seri Begawan - only passing through immigration once. The ferry takes around 90 minutes. For more information, read about getting around Sarawak and getting around Sabah.